Located in the northeast corner of Westchester County, in the Town of North Salem, more than 30 miles north of New York City. Formed by the damming of the Titicus River, which continues west and drains into the Muscoot Reservoir. Consists of a single basin, approximately 2 miles long. Holds 7.2 billion gallons at full capacity. Placed into service in 1893. The Titicus is one of 12 reservoirs in the City’s Croton system. 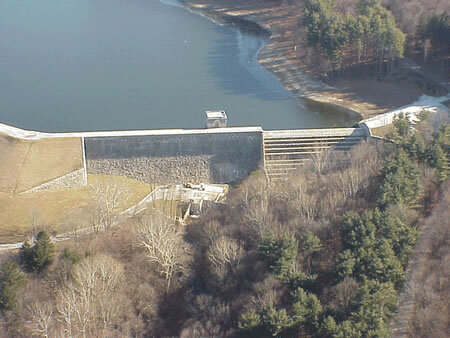 Water exits from the western portion of the Titicus and travels by stream into the nearby Muscoot Reservoir, from which it moves into the New Croton Reservoir. From there it enters the 24-mile-long New Croton Aqueduct and flows into the Jerome Park Reservoir in the Bronx, where it enters New York City’s distribution system. The Titicus watershed’s drainage basin is 24 square miles, and includes portions of the Towns of Lewisboro and North Salem in Westchester County, Southeast in Putnam County, and Ridgefield in Fairfield County, Connecticut.